Hey y'all! Yesterday, literally every single hour of my day was completed planned out and packed. I felt like I could barely catch my breath before I needed to head to my next errand, task, appointment, etc. By 6pm, I just wanted to lay in the pile of warm laundry (that I restarted three times in the past two days) and eat bread. No motivation! I am hoping to squeeze in a little relaxation today but my planner isn't looking like it's going to allow it. Bring on the weekend! 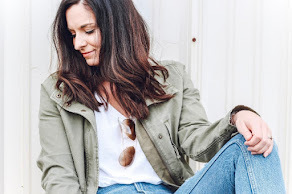 Today, I am sharing the softest clothing item that I have ever worn and a pair of boyfriend jeans that are actually flattering! 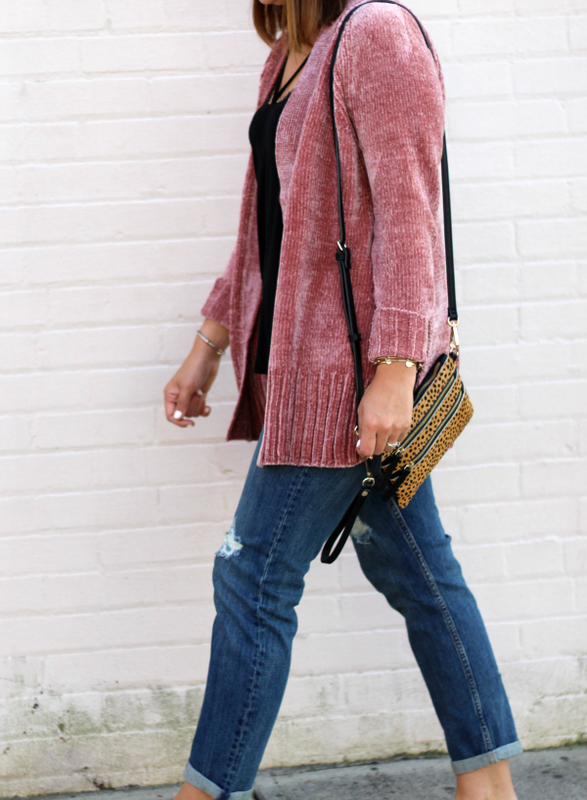 This cardigan is the prettiest shade of blush pink and seriously cozy. I plan to wear it all fall and winter long! I also recently bought the cutest black dress to wear with it and I'll be sharing how I'm styling that dress next week. I sized up one size in the cardigan because I like a more oversized fit, especially when it comes to sweaters because I love to layer when it's cool outside. I paired the cardigan with a sassy black tank, leather slides, an animal print bag, and the very best boyfriend jeans! I am a big fan of Old Navy jeans in general because the price is super affordable and the fit is great. 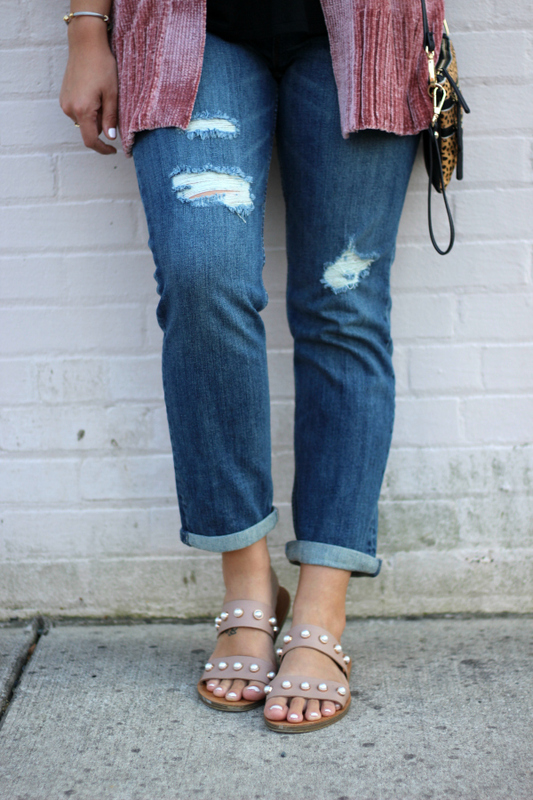 Like I mentioned above, this pair of boyfriend jeans is actually flattering. A lot of boyfriend style pants fit too loose and the rise is all wrong. But these are perfect. They have a mom friendly mid rise, tasteful distressing, and they hold their shape all day long! I found them to fit true to size and y'all, they are under $40! So sorry in advance for how much you will be seeing these two pieces incorporated into my fall and winter wardrobe. I got that cardigan and it is so cozy! Love how you styled it! I love a good soft cardigan!! They're the best! That sweater looks so cozy! 🔥 Makes me so excited for colder weather. It's so hot in Boston right now. I am obsessed with your cardigan! The color is perfect! I love your cardigan and your shoes! So so so cute! I so need that cardi! It's a definite must!